*from anywhere in Dublin, Bray, and parts of south-east Meath. *A small additional fee applies for the other areas of Wicklow, Kildare and Meath from which collections can be done. Our best value collector offers collections in North Dublin and South-East Meath on Mondays, Wednesdays and Fridays between 9.30am and 4pm, and in South Dublin, North Wicklow and East Kildare on Tuesdays and Thursdays between 9.30am and 4pm. If you require collection from an area of Wicklow, Kildare or Meath not covered by this collector, or you require collection outside the hours offered by this collector, we can also offer this service. You can request a quote for out of hours and other area collections here. Our partner is a licenced waste collector that specialises in recycling of beds and mattresses. Because our bed and mattress collector specialises solely in the collection of beds and mattresses, and because, due to their wealth of experience, they can recycle every part, they can offer much lower rates for bed and mattress collection in Dublin and The Greater Dublin Area than other authorised waste collectors. Fully licenced by the NWCPO, our disposals partner holds Waste Collection Permit, which will be produced on request on the day of collection. Our service partners are fully insured and licenced to offer a bed and mattress disposal in Dublin and the greater Dublin Area. Under waste disposal legislation, it is illegal for a person to hand over waste* (including beds and mattresses) to anyone other than an authorised waste collector who is in possession of a valid waste collection permit. Failure to comply with this law can lead to heavy fines for both the owner of the waste and for a person collecting waste without a permit. Our waste collector does have a valid waste collection permit, which can be produced at the time of collection. *Any item you no longer want and wish to have collected, including beds and mattresses, is considered waste, regardless of their condition. If you need to dump old beds and mattresses and require a larger vehicle because you cannot fit these large items into your car, or because you don’t own a vehicle, e-Van Transportation offers the ideal solution for cheap bed and mattress disposal through our disposals specialist. A large box-back truck or a van is used, depending on the quantity to be collected. 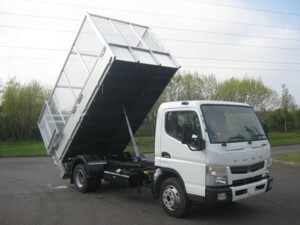 The vans or truck will comfortably transport beds and mattresses of any size to their authorised recycling facility.